Capcom has revealed a rather unique and somewhat tempting pre-order bonus to those who decide to pre-order their copy of Resident Evil 6: a free "full size" Umbrella Corporation umbrella. 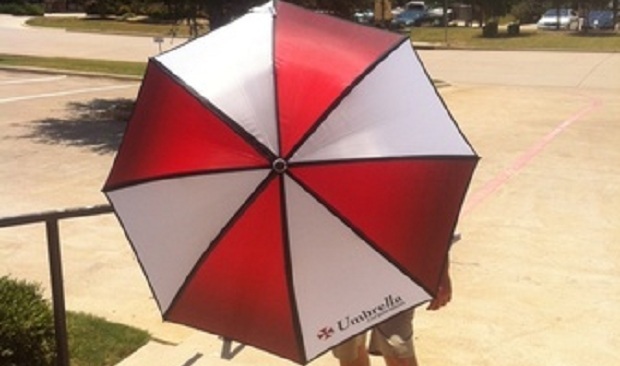 The umbrella comes complete with its own custom sleeve to carry it around in and the umbrella itself bears the "Umbrella Corporation" logo so, please, do look out for any agents that may take offence. Capcom stated that "the only catch is you need to place your order through the Capcom Store" so it appears - for the time being at least - that this is a Capcom Store exclusive. If you're interested in the umbrella but not so much in pre-ordering Resident Evil 6 itself, you can purchase the umbrella separately for $16.95.